On the anniversary of the murder of a local postal carrier, the News4 I-Team shows a never before released list of crimes committed against postal employees, including a dramatic increase in robberies. It started out like any other February day for a well-known D.C. postal carrier who delivered the mail on Webster Street in Northeast. But that changed when, investigators say, two men robbed him at gunpoint before tying him up with duct tape, beating him and throwing him from his delivery van. Neighbors like Bernard Wood Jr. were stunned at the violence of the crime. "I don't understand why anybody would try to assault or hurt him." But as they thought about it, those on his route like Sherri Wyatt realized he was an easy target. “Every day I know he's going to be there,” she said. “I know what time." We only found out about this robbery because the US Postal Service told us about it. Investigators with the US Postal Inspection Police needed help finding the assailants. But the News4 I-Team discovered there are hundreds of similar crimes each year no one ever hears about. The News4 I-Team obtained a nationwide list, never before released to the public, of more than 1,600 violent crimes against postal employees. We found robberies increased more than 300 percent between 2010 and 2013, some involving truckjackings, kidnappings and shootings. 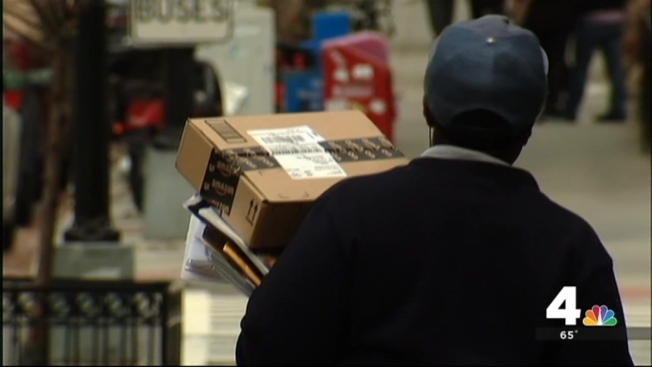 Tom Dodge with the grassroots organization Community and Postal Workers United told us, "Unfortunately, very expensive items are going through the mail now. Cell phones, computers, tablets, jewelry." Dodge said the rise of Internet shopping has made his job as a truck driver more dangerous than ever. "What we're told is, ‘Just give it to them. Give them your satchel of mail, if a big truck is stopped, give them what they want. Don't resist, let them have it.’ But thieves today, they don't want witnesses. So they shoot." The I-Team discovered at least 64 shootings on the list, including the murder of Tyson Barnette, killed on his route delivering mail in Cheverly one year ago this week. Dodge and union leaders from all over the region held a protest on the National Mall following Barnette’s murder. Tina Collington, a letter carrier for Capital Heights, Maryland, said, “The sad thing is when things are happening, they won't bring it to our attention. We'll hear word of mouth from someone else. But management doesn't say be aware this is going on." Records the I-Team obtained show all kinds of employees get robbed, including commercial truck drivers and mail clerks. But 84 percent of victims were the men and women who deliver the mail to your homes. And they don't happen at night. Instead, 80 percent of robberies occur during the day between 5 a.m. and 5 p.m. The I-Team spent months asking to interview Postmaster General Patrick Donahoe and finally caught up with him at a stamp event at the Postal Museum, where he said, "Robberies occur across America. We're represented in every city in the US and it happens unfortunately." “But your folks tell us they're easy targets and they're worried about their safety and they want the postal service to do more to protect their safety," the I-Team said. “We provide a lot of, we provide very good safety for employees in areas that have high crime and we provide bulletproof glass, we make sure that people aren't out at night in terms of money, like that,” Donahoe said. “We're very conscious of that issue." But Dodge says they need more than the can of pepper spray they're given to protect themselves. "You shouldn't go to work every day and worry you're going to be attacked. You shouldn't come to work and worry about whether you're going to get hurt on the job."